“Dear Captain Comics: I have watched ‘Avengers: Infinity War,’ and now I’m scared, heartbroken and a little confused. Can you help me? Q. Has all this happened before in the comics? For example, Captain America punches the Mad Titan in the snoot in “Infinity War,” which was pretty satisfying – but also familiar. He managed that trick in “Infinity Gauntlet” (1991), and did the same with Adolf Hitler on the cover of the first issue of “Captain America Comics” (1941). He’s got a knack for it, doesn’t he? There were plenty of other comics homages in “Infinity War,” such as Thor replicating Captain America’s rescue from the ice in “Avengers” #4 (1964), but the ones above are the biggest. Q. So the fourth Avengers movie will adapt the rest of “Infinity Gauntet”? A. Not possible. Many of the major players in “Infinity Gauntlet” – Adam Warlock, Silver Surfer, Mephisto, a variety of cosmic beings – aren’t available for Avengers 4. On the other hand, “Infinity Gauntlet” was a six-issue miniseries, with each issue running 48 pages. That’s a lot of material available to reference or adapt, even if it can’t be lifted directly. Nebula, for example, is a huge part of Thanos’ defeat in “Infinity Gauntlet” #6 – and guess which adopted daughter of the Mad Titan is still alive and hanging with Tony Stark at the end of “Infinity War”? Q. What the heck was that post-credits scene about? 1. It reinforces that Thanos erased half of life across the universe, not just in Wakanda. 3) The symbol on Fury’s beeper is that of Captain Marvel, who appears to be the cavalry for Avengers 4. A. Captain Marvel is Carol Danvers, a U.S. Air Force pilot and intelligence officer, who becomes Captain Marvel when a Kree weapon infuses her with alien DNA, resulting in major super-powers. We’ll see all that in “Captain Marvel,” starring Brie Larson, a Marvel movie coming March 8, 2019 – three months before Avengers 4. It’s set in the 1990s, so “Infinity War” is still in her future. Q. Is that the only Marvel movie between now and Avengers 4? A. Nope, “Ant-Man and Wasp” is coming July 6, 2018. 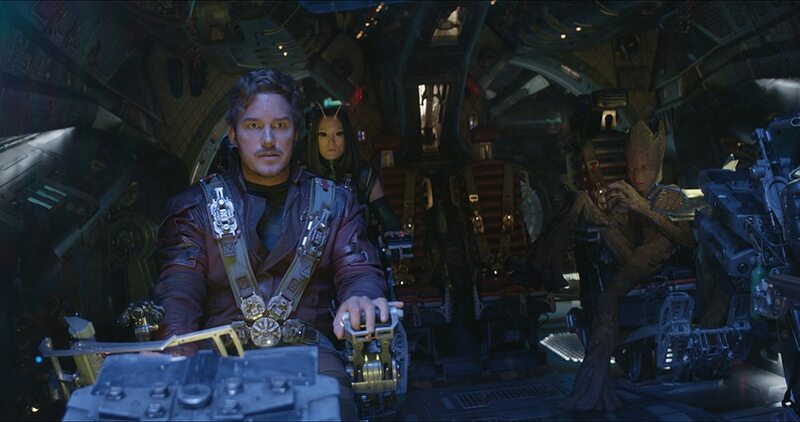 That movie takes place before (and possibly during) the events of “Infinity War,” but the cast will apparently be dealing a lot with the “Quantum Realm” – a place “outside time and space,” and therefore outside the reach of Thanos’ Time and Space stones. That may very well factor into Avengers 4. 1) In “Infinity Gauntlet,” not only does Thanos kill half the universe with a snap of his fingers, he also kills the remaining Avengers one by one. But none of it sticks, because the Infinity Gauntlet can resurrect as easily as it kills – and at the end of “Infinity Gauntlet,” it’s not the Mad Titan that holds title to that nifty glove. In other words, there’s comics precedent that everyone who was “dusted” in “Infinity War” has a “Get Out of Death Free” card. The “Infinity War” trailers also showed Bucky Barnes (aka White Wolf), Black Panther, Black Widow, the Dora Milaje, the Hulk, Steve Rogers (aka Nomad), a Wakandan army and War Machine charging into battle. But in the movie, that scene never appeared – Bruce Banner was in the Hulkbuster armor, instead, because Hulk refused to emerge. Does it make sense that Marvel would spend money filming that scene with the Green Goliath just for the trailers? Or will that scene get re-played in Avengers 4, this time with a fighting-mad Hulk? Fortunately, there’s an established way out: When Thanos killed Gamora in the comics, Adam Warlock (whom you will meet in “Guardians 3”) sucked her soul into the “Soul World” in his Soul Gem, a plane of existence where souls can live on in peace and harmony after the deaths of their bodies. Later, Warlock implanted Gamora’s soul into a dying woman to serve as a vessel for Gamora’s resurrection. And wouldn’t you know it? In “Infinity War,” Thanos visits a plane of existence with tangerine skies, and chats with a too-wise child version of Gamora. Since the Soul Stone is orange, that’s just what you’d expect Soul World to look like. The presence of Gamora’s soul all but guarantees her return. Odds: 99.9 percent.